Product Junkie Diva: Did Sally Hansen Nail it? Is it me or has the world of nail polish and nail care been elevated to a level not seen since the emergence of the Lee Press On nail craze. Ok so maybe I am dating myself, but the point is if ever you wanted your nails to have a little extra pizzazz then this is the era for you. Not wanting to be left behind Sally Hansen has jumped on the textured nail polish bandwagon to give us the Fuzzy and Sugar Coat collections. Pictured below is the Sally Hansen Fuzzy Coat collection, each bottle features multicolored flecks that are floating in a clear base polish. The colored fuzzies that you see above are swimming in plain old clear nail polish. 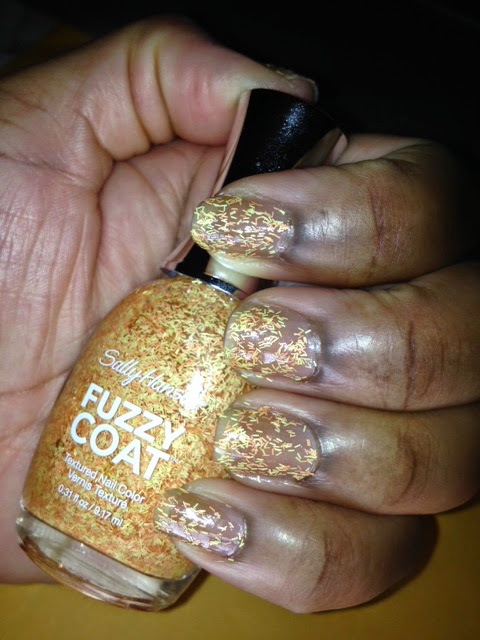 If you would like, you can simply apply the fuzzies on to your nails and go. However, I think these polishes look best if you use a colored base coat and then apply the fuzzy color of your choice. Since these bottles are filled with many individual fuzzies, you may find that while painting your nails the fuzzies are not evenly distributed, so you may be required to readjust the fuzzies or apply an additional coat. The textured polish removal process can be just as grueling as it is to remove glitter polishes. The fuzzy polishes leave those fuzzy little flecks on my fingers after I have removed the polish. I generally have to either wash my hands at the sink or have a towel nearby for a quick clean up job. On a scale of 1-10 where 10 represents great difficulty, I would rate the fuzzy removal process at a 7. The difficulty in removing the fuzzies increases as you apply more coats. I've seen the fuzzy polishes priced anywhere from $5.69-$8.99, so you may have to keep your eyes peeled if you're looking for the best deal. I purchased my fuzzy polishes from Target for roughly $5.69 and then I used my $2 off coupons...SCORE! Before the fuzzies hit the scene you may have seen their distant cousins "effects" by Essie and "feathers" by Nails Inc. Although they may have different names they all seem to be the same product. I didn't purchase the feathers polish from Nails Inc but I certainly tried it on at the Sephora nail bar. Once the polish dried I didn't see a reason to fork over $9.50. The main difference is that the Nails Inc polishes are formulated without some of the harsh chemicals typically found in nail polish, so that may be worth the higher price tag. Nevertheless, the chemical laden Sally Hansen fuzzy polishes are offered in more colors than you would typically find in other feather/ effect polish collections. So let's get to it, here are the fuzzy coats that I purchased. The orange and yellow color is named "Peach Fuzz". 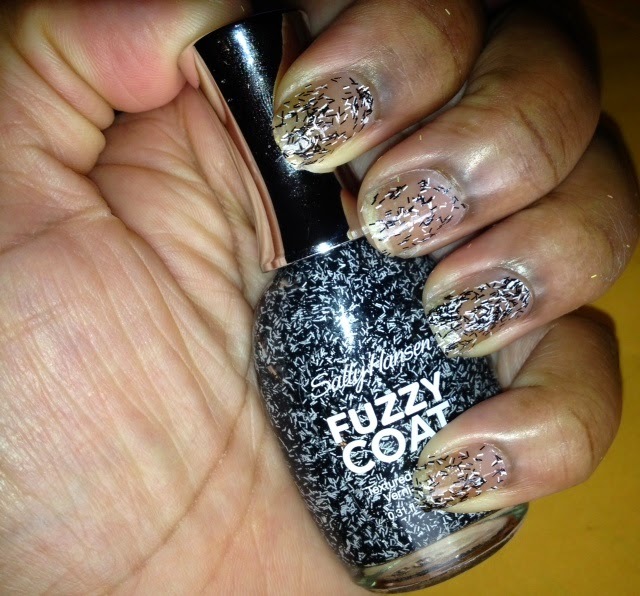 Next up I have one coat of the black and white fuzzy polish named Tweedy. 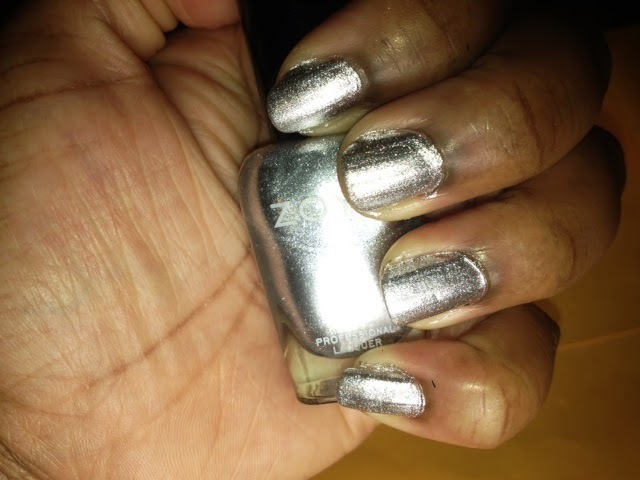 In the picture below I applied Trixi by Zoya, a high shine silver metallic polish. Then I topped Trixie off with Tweedy. As you may have noticed, if you use a light base, the white fuzzies may blend in a bit but the black fuzzies in the Tweedy polish really pop. The opposite happens if you use a dark colored base coat as shown below when I used a black polish, Zoya's Raven, as my base coat. 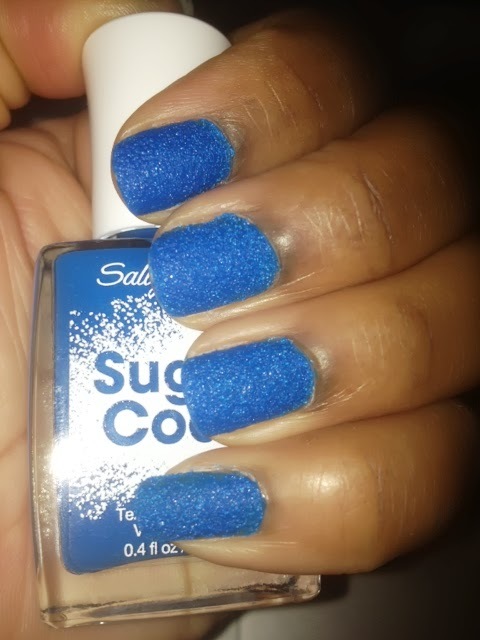 For more Sally Hansen textured fun, check out the full sugar coat line along with my swatches. Below are the colors that I purchased from the Sugar Coat line. The green color is the only one that isn't pictured above, but you can see it clearly in the picture below. No ma'am this looked like white out that had congealed in the bottle, I didn't like it at all. It's only fair to state that I am never excited when it comes to white polish, so my distaste for this color wasn't a huge shocker. I was hoping that the textured nature of this polish could temper my aversion to white polish, but alas that was not the case. In fact the white polish even seemed to have a chalkier texture, which was equally displeasing. I think a little of my cuticle oil may have trickled onto my nails giving it a shinier appearane, however the color that you see and texture is completely accurate. The sour apple color just looks delicious to me, this one may be my favorite. In answer the to question posed in the title of this blog, I say eh, Sally did enough to stay in the textured game, they are probably better than many of the store brand textured polishes that I've purchased. The Fuzzy Coat collection is on par with the feathers and effects textured polishes, but the sugar coat is a bust when compared to Pixi dust from Zoya. Although Pixi Dust is a different type of textured polish I am mainly referring to the quality of the texture. If you look at the Sally Hansen images, the sugar coat polishes seem to perform much better than it did when I painted my nails so that's a bit of a problem for me. Overall, it isn't horrible and it's a nice way to change up your look this summer. So have you taken a dive into the textured nail polish pond? Which brands feature your favorite textured polishes? I agree about Sally Hansen esp with their nail polish salon effects I love those!